Both adults and children desperately need adequate sleep, to rest their tired brain and muscles after a day of activity. Especially in children whose activities are very active, sleep becomes a necessity that must be met. Especially when sleeping brain development will be much more rapidly, so the lack of sleep can make the mental development of children disturbed to happen stress in children. Sleep patterns of children according to their age is very important, because good sleep time for children needs to be met to support the child's body health. 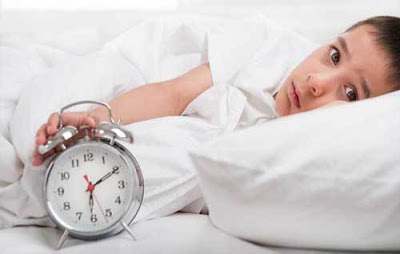 Sleep disorders in children are of particular concern to every parent so that children do not show signs of malnutrition due to the exhausted body. Here are the kinds of sleep disorders in children who need to be known in order to find a solution to overcome them. Insomnia can occur both in infants and children, where children have difficulty sleeping, or easy to wake up and cannot sleep again so that the sleep becomes less. Symptoms of insomnia in children can clearly look like a child feel tired, not excited, difficult to concentrate to be fussy. Even children who experience insomnia cannot enjoy the benefits of naps for children. Parasomnia is a condition in which children perform activities during sleep such as sleep disturbances runs in children and the dangers of delirious children while sleeping. Not infrequently children who experience parasomnia grit their teeth while sleeping, talking to themselves, eat while sleeping and so forth. The condition is also called sleep stage awake because the child looks like waking when actually sleeping. But parasomnia is not so disturbing health and does not affect the psychology of children in the future. Sleep apnea is a condition in which the child has a short-lived breath due to respiratory disturbances in the upper respiratory tract. As a result, the air can not flow smoothly so often cause the child to awaken while sleeping. Sleep apnea is divided into 3 types, namely central apnea, obstructive apnea and mixed apnea, where this apnea can last up to 10 seconds or more. The effect is that the child will feel sleepy during the day because of disturbed sleep and lack of oxygen delivered to the brain when apnea occurs. Narcolepsy is a sleep disorder that can make the sufferer drowsy unbearable and can sleep in any place because it can not control his drowsiness. This condition can be experienced by some children, where this disorder occurs due to a neurological disorder so that the central nervous system disrupted. Sleep deprivation includes sleep disturbances caused by diseases such as fever and pain, medication, environmental atmosphere, and stress or emotional state. This condition makes it easy for children to wake up in the middle of the night and find it difficult to get back to sleep. Parents need to address the underlying causes of sleep deprivation so that children can enjoy their sleep time without interruption. Hypersomnia is somewhat similar to narcolepsy, the difference between narcolepsy can occur repeatedly in a day, whereas sleepy hypersomnia is felt continuously so that children who experience it can sleep for 16-20 hours a day. This condition leads to the growth and development of children experiencing disruption, can even lead to nutritional deficiencies because the hour passed due to continuous sleep. That's all kinds of sleep disorders in children that parents need to know, and if it happens to your child should be addressed so as not to adversely affect the health and life of children. Sleep is a necessity for children, and the disturbance experienced will make the quality of child's sleep to be disturbed. Also read : How About Taking Care of Your Kids Health.